HILO — The Hawaii State Department of Health (DOH) is reminding the public to be aware of angiostrongyliasis (rat lungworm). DOH has identified 4 probable cases of illness in 2011, and all were residents of the Big Island. The department is cautioning the public to wash produce thoroughly, clean food preparation areas, and keep foreign items out of children’s mouths to prevent unwanted exposure to pesticides, bacteria, and parasites such as Angiostrongylus cantonensis or rat lungworm. The parasite Angiostrongylus cantonensis causes a rare form of meningitis called angiostrongyliasis. This is a condition also referred to as “rat lungworm disease” because rats are the definitive host for this parasite. The parasite can be found in snails, slugs, and rats throughout the State of Hawaii and may also be found in freshwater varieties of prawns, and crabs. Eating contaminated uncooked or undercooked snails, slugs, and freshwater prawns may cause the infection which can lead to serious illness. Keeping home gardens free of rodents, snails, and slugs can reduce the risk of rat lungworm disease. Washing all raw vegetables and fruits thoroughly and visually inspecting them to be sure they are free of slugs or snails before eating them is also a preventative measure. Cleaning and maintaining all food preparation surfaces such as counter tops and cutting boards are important food safety practices. To ensure the safety of young children and infants keep foreign items out of their mouths, and keep their hands clean. Signs of rat lung worm disease can include severe headaches, nausea, vomiting, neck stiffness, skin and light sensitivity, and other problems related to the brain and spinal cord. Most patients recover from the infection without treatment. If you think you may have angiostrongyliasis, see your health care provider and let him or her know of your possible exposures. The nematode (roundworm) Angiostrongylus cantonensis, the rat lungworm, is the most common cause of human eosinophilic meningitis. In addition, Angiostrongylus (Parastrongylus) costaricensis is the causal agent of abdominal, or intestinal, angiostrongyliasis. Adult worms of A. cantonensis live in the pulmonary arteries of rats. The females lay eggs that hatch, yielding first-stage larvae, in the terminal branches of the pulmonary arteries. The first-stage larvae migrate to the pharynx, are swallowed, and passed in the feces. They penetrate, or are ingested by, an intermediate host (snail or slug). After two molts, third-stage larvae are produced, which are infective to mammalian hosts. When the mollusk is ingested by the definitive host, the third-stage larvae migrate to the brain where they develop into young adults. The young adults return to the venous system and then the pulmonary arteries where they become sexually mature. Of note, various animals act as paratenic (transport) hosts: after ingesting the infected snails, they carry the third-stage larvae which can resume their development when the paratenic host is ingested by a definitive host. 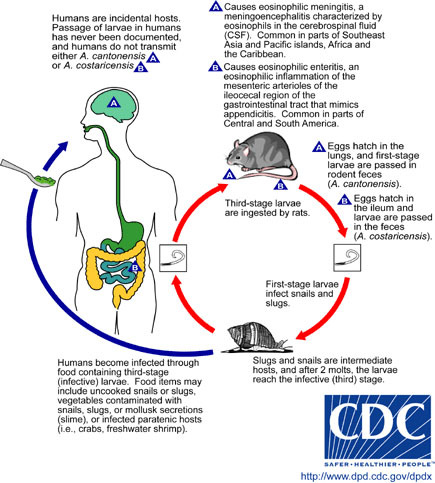 Humans can acquire the infection by eating raw or undercooked snails or slugs infected with the parasite; they may also acquire the infection by eating raw produce that contains a small snail or slug, or part of one. There is some question whether or not larvae can exit the infected mollusks in slime (which may be infective to humans if ingested, for example, on produce). The disease can also be acquired by ingestion of contaminated or infected paratenic animals (crabs, freshwater shrimps). In humans, juvenile worms migrate to the brain, or rarely in the lungs, where the worms ultimately die. The life cycle of Angiostrongylus (Parastrongylus) costaricensis is similar, except that the adult worms reside in the arterioles of the ileocecal area of the definitive host. In humans, A. costaricensis often reaches sexual maturity and release eggs into the intestinal tissues. The eggs and larvae degenerate and cause intense local inflammatory reactions and do not appear to be shed in the stool. Most cases of eosinophilic meningitis have been reported from Southeast Asia and the Pacific Basin, although the infection is spreading to many other areas of the world, including Africa and the Caribbean. Abdominal angiostrongyliasis has been reported from Costa Rica, and occurs most commonly in young children.